plus in the State of North Carolina. Several new laws were passed to increase the safety of bicyclist in North Carolina. Here is a summary of the new bicycle friendly laws that were passed in NC this year. bicyclist, or the passing driver must completely enter the left lane of the roadway. hand, as an alternative to raising the left hand. bicycle so that the rider is visible to on coming traffic. Weekly rides, trail work days, social events and fundraisers. Join our Facebook Group at Spartanburg Area Mountain Bikers. that take place in or through Polk County, NC. all have full on course support provided to the riders. None of these events are considered to be Sanction Races. Was ended in 2017. The main reason is that there were not enough people willing to assist in staging this event. Therefor I have been asked to put the old web page back on line for those of you that might wish to ride the old Fabulous 4th Tour Route. This link contains the maps and cue sheet with other information minus the registration section. Please feel free to down load all 3 of the maps and cue sheets and ride this route any time you might wish. Just be mindful of the weather. The best time to do this ride is in the Fall Color Season! Mid to late October is the best time. The Assaults on Mt. Mitchell and Marion Challenge. 102 miles with about 11,000 total vertical feet of climbing pits you against the mountain - The Assault Mt. Mitchell Challenge. The first 2/3rd of the 102 miles works out to be about 72 miles with about 6,000 feet of climbing. Now for the last part if the challenge really shows it ugly head. There is still another 26 miles plus another 5000 feet of climbing facing you! You better have the legs to make this climb !!!! John Bryan ~ Founder of this challenge. and information not found on the 'official' web site. as the times of all of the know riders for each year. 80 mile challenge with 3 major and very steep climbs. 50 mile challenge with 1 major steep climb. May still have a few openings left! Full information for all rides on line. Power Games is scheduled in Charlotte NC. A total of 24 different sports events. For full listing of all events / dates / cost / lodging etc. of the ride and the links to the event pages. All maps listed below are in PDF and have been either Zipped or put in RAR file format, just Unzip the map(s) and print out. Several Counties in North Carolina have local bicycle maps. Below are some of the ones I am able to find and scan in. and will require a little time to download. These tours are through the State of North Carolina. There are 9 different routes to choose from. 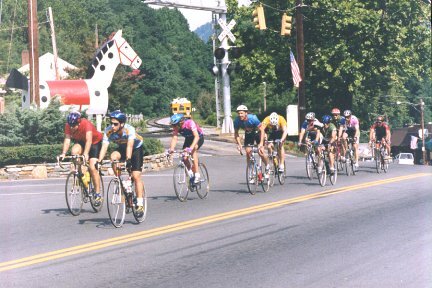 These tours are well marked with State of NC bicycle route signs indicating the correct way to follow. Two of the routes cross the state from west to east. It is recommended that you start on the western end and work east! Do the climbing first and enjoy the lowlands last. The rest of the rides are shorter routes that run in all directions. All require either overnight camping or a place to stay while riding the tours. Lodging and food is available along all of the routes. These bike routes are for the most part back roads so that traffic is normally not a problem. Some of the tours in the mountains are not easy rides. These roads can be very steep and curvy. It is also recommended that you have a VERY Bright Red Blinker Light on the back of you bicycle as a warning to cars following you so that you are as visible as possible to the drivers behind you. It is also recommended that you have a headlight as well for safety sake. While on the Blue Ridge Parkway you are required by US Park regulations to have a warning light or reflector facing to the rear and a head light or reflector facing forward while in the tunnels as some of the tunnels will be totally dark and are quite long. These long tunnels are located on the western end of the parkway after you pass by Boone NC. The routes are drawn in a black line on the maps below. All maps listed below are in PDF and have been either Zipped or put in RAR files. Designated as a portion of US Bike Route 1, which runs from Maine to Florida, this route covers almost 200 miles of rolling terrain north-south through central North Carolina. San-Lee Park, Umstead State Park, and Kerr Lake State Recreation Area lie along this route, providing an opportunity to incorporate activities such as swimming, fishing, hiking, and nature study into the trip. Other points of interest include the Indian Museum of the Carolinas, Weymouth Woods Sandhills Nature Preserve, House in the Horseshoe State Historic Site, and the numerous historic sites and museums of the Raleigh/Capital City area. The longest tour in our state. From Murphy in the mountains to Manteo on the coast, this 700+ mile route traverses the state from west to east. On the way, you'll pass the loftiest peaks east of the Mississippi, traverse portions of the Blue Ridge Parkway, then drop 2,000 feet from the Blue Ridge escarpment to the rolling foothills of the Piedmont. Quiet rural lanes take you through lush farm country to most of the major cities in the state. Once past Raleigh, the flat land of the coastal plain makes the ride to the coast seem easy. Several miles from the end of the route, you have the choice of taking the ferry to Ocracoke and the Outer Banks or continuing to Manteo. Either way, wide Atlantic beaches are your reward at the end of the trip. It is highly recommended that you rider this route from West to East. Expect a lot of climbing on the western 1/3rd of this route. Once you drop down the going is much easier. North Carolina's coast is long and varied, with two major sounds—the Pamlico and the Albemarle—and a series of barrier islands known as the Outer Banks. The 300-mile route from South Carolina to Virginia takes you to all the major ports of the colonial era—Southport, Wilmington, New Bern, Bath, and Edenton. Take the time to relax on the wide, sandy beaches, explore the charming historic towns, and enjoy the excellent seafood. Other points of interest along this route include Fort Fisher State Historic Site, Carolina Beach State Park, the Croatan National Forest Recreation Areas, Tryon Palace, Goose Creek State Park and Merchants Millpond State Park. Running east-west just south of the Virginia border all the way from the mountains to the coast, this 400-mile route gives you access to six state parks and several other recreation areas. You'll be able to explore areas such as Stone Mountain, Pilot Mountain and Hanging Rock State Parks, Hyco Reservoir, Kerr Lake and Lake Gaston Recreation Areas, Merchants Millpond State Park, and the Dismal Swamp and Currituck Sound areas. Campgrounds are spaced up to 75 miles apart and motels are scarce, so be prepared for some long days. This 160-mile route roughly parallels the course of the Cape Fear River through the southeast coastal plain to the sea. Rolling hills soon give way to flat land in the swamps and Carolina bays typical of this region of the state. Notable points of interest include Jones Lake State Park, Moore's Creek National Military Park, the USS North Carolina Battleship Memorial, Brunswick Town State Historic Site, Carolina Beach State Park, and Fort Fisher State Historic Site. Use this 200-mile route as a southern alternate to the Piedmont portion of the Mountains to Sea route or combine the two to create a Piedmont Loop, a perfect 7- to 10-day trip. Abundant recreational opportunities exist at places like Lake Norman, Morrow Mountain State Park, the Uwharrie National Forest and the North Carolina Zoological Park. Other points of interest along the route include the Reed Gold Mine State Historic Site and the Seagrove Potters Museum. From its western terminus along the Mountains to Sea Route near Wilson, this 170-mile route winds its way through the coastal plain to the Cedar Island Ferry over to Ocracoke. Along the way, points of interest such as Cliffs of the Neuse State Park, the New Bern and Beaufort historic districts, and the Cedar Island Wildlife Refuge provide a glimpse of the natural and cultural diversity of the state. This 120-mile route begins with an exhilarating 15-mile plunge down the Blue Ridge escarpment—a drop of 2,400 feet— followed 25 miles later by another 1,000 foot drop down the 4-mile Saluda grade. Waterfalls, trout streams, hiking trails and idyllic picnic spots abound. Take time to explore the charming mountain towns of Brevard, Flat Rock, Saluda, and Tryon in Polk County. Or stop at one of the many points of interest along the way—the Cradle of Forestry, Sliding Rock, Davidson River Recreation Area, the Carl Sandburg National Historic Site, Flatrock Playhouse, and Holmes Educational State Forest. Leaving the highlands behind, the remainder of the route rolls through the foothills past dense forests and settled farmlands to join up with the Piedmont Spur Route #6 near Lincolnton, NC. From the Pee Dee River to the Cape Fear, this route traverses 125 miles of Sandhills terrain. Rolling hills rise from 500 to 700 feet above sea level and longleaf pine forests line the quiet roads through this region. Major points of interest include the Uwharrie National Forest, Town Creek Indian Mound, and Weymouth Woods Sandhills Nature Preserve.